This styled shoot outside Bakery 105 in historic Wilmington, N.C., showcases one of the most timeless and popular wedding staples: the color of blush. The gorgeous venue, with its white walls and exposed brick, is the perfect canvas for creating a wedding fit for a pink-loving bride. Armed with lace-inspired heels, the scene is set for a bride inspired by classic styles with a modern flair. 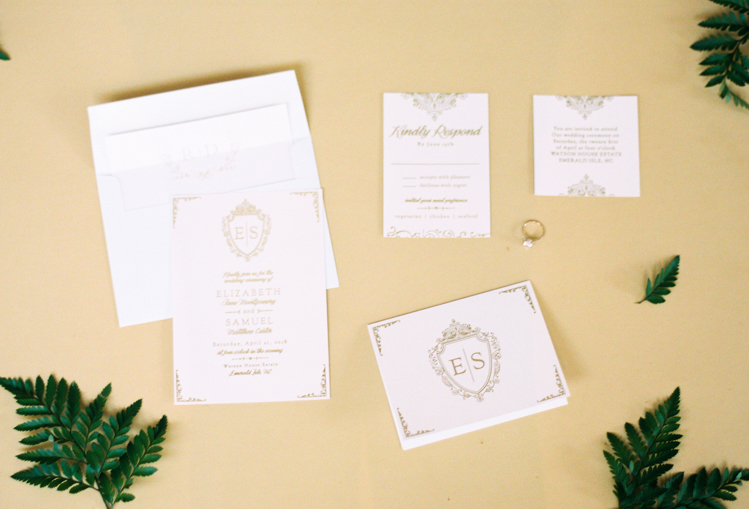 The idyllic invitation suite features a simple, clean white color palette marked with an ornate monogram and luxurious accents. 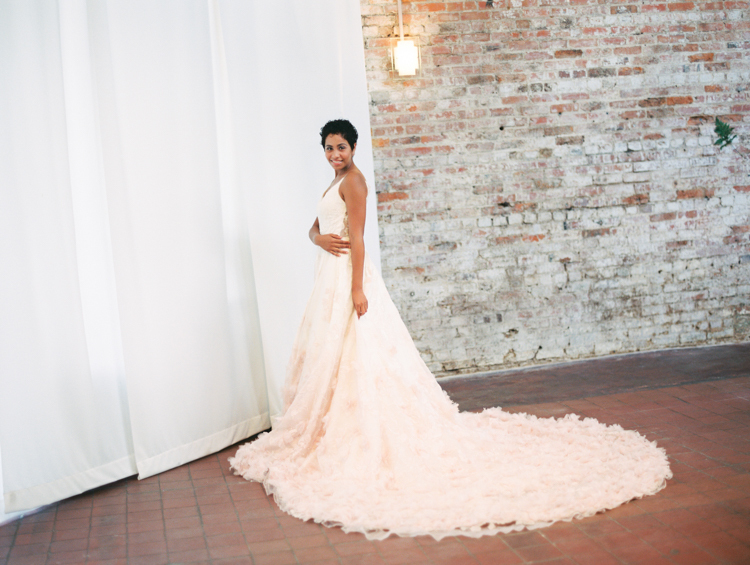 The blush color shows through the bride’s stunning Kelly Faetanini gown. The exquisite application of blush floral details on the skirt is both soft and dramatic. 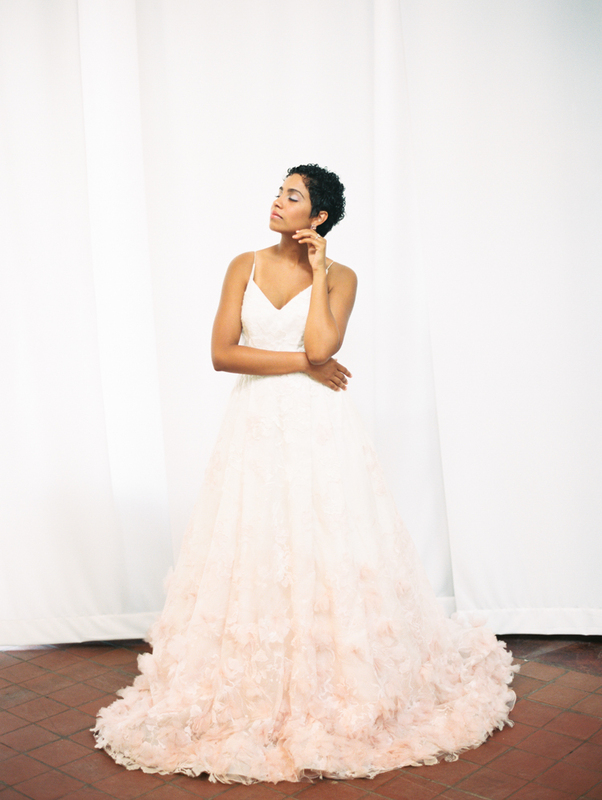 The simple straps and lace bodice balance out the voluminous skirt to create a beautiful blush-inspired silhouette. 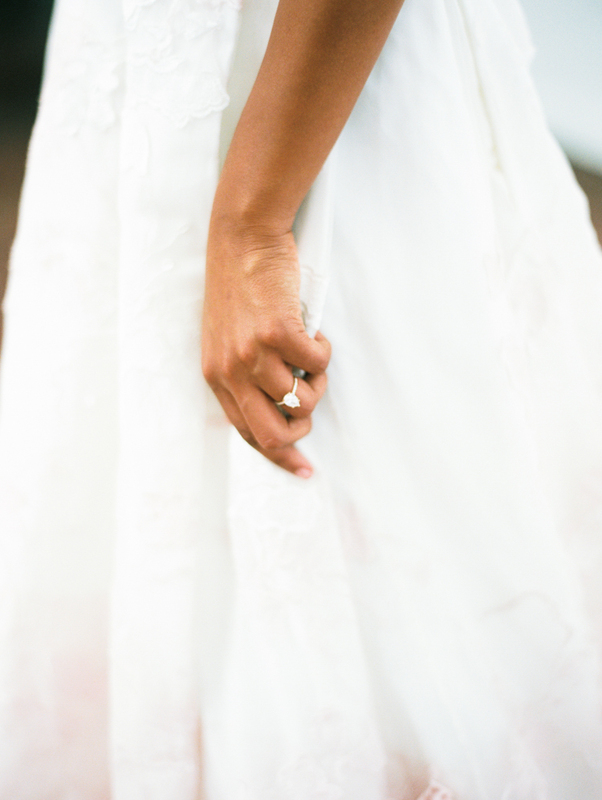 The bride’s makeup is light and airy with a rosy lip, highlighting her natural beauty in a classic way. Her look stands out against the white fabric panels and exposed brick of Bakery 105 and is emulated through delicate floral details around the space. 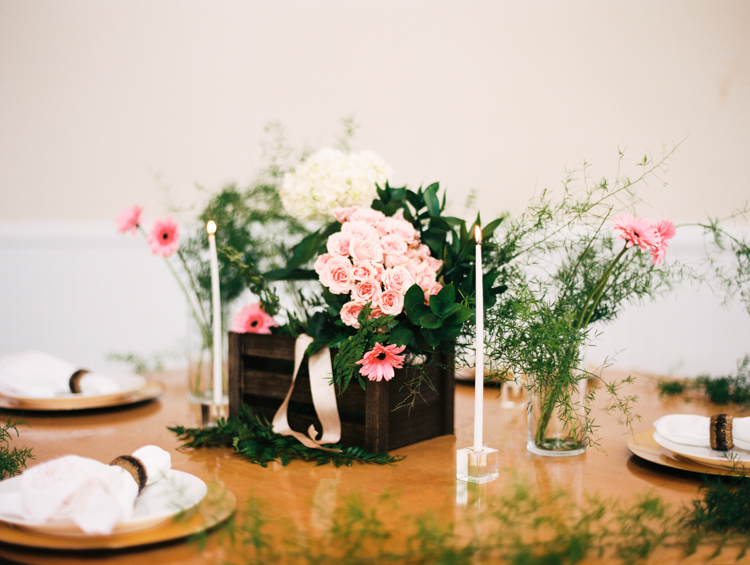 Small pink daisies pop against a natural wooden table. White and gold place settings and a rustic-inspired centerpiece bring the tablescape together. The bride also incorporates the blush inspiration with a classic pink rose bouquet. The rich greenery is a bed of color that shines against the bright ambiance of the room. 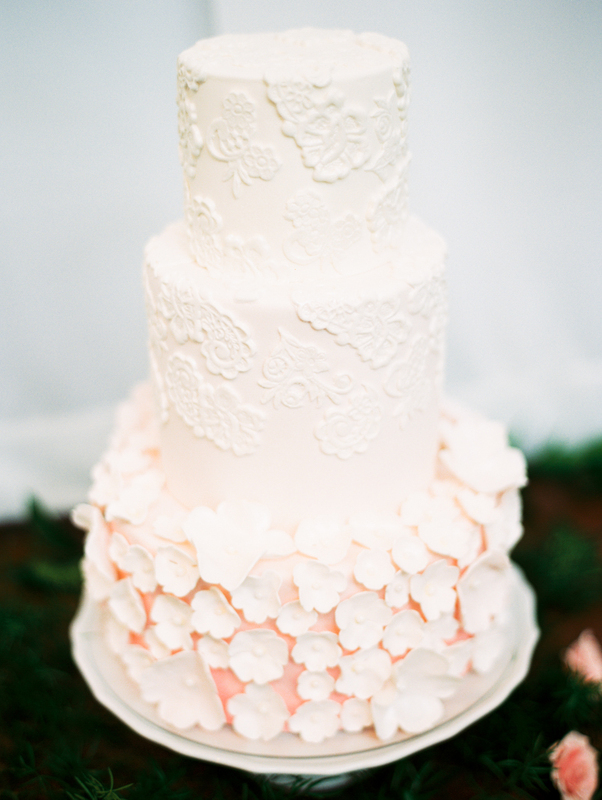 The wedding cake channels the bride’s gown for its design inspiration. Three beautiful tiers present a blush ombré color scheme. The top two tiers feature white lace appliques while the pink base is beautified with plush pink sugar flowers. This cake is truly almost too pretty to slice! The bride takes her blush-loving look outside to The Cottage on Orange Street, where the historic Wilmington aura is front and center. She relishes in the cottage’s flourishing greenery, a tantalizing addition to the scene where her gown is on full display. The final shot shows the bride in front of a weathered window, where the delicate details of her bridal look contrast with the sharp angles of the building’s wall. As we see in this styled shoot, blush - and all the ways it inspires - will never go out of style. The color’s cherished femininity has been coveted by brides for decades and remains a hue many will continue to pour into their special days. Whether it’s a gown, a cake or a floral arrangement, the possibilities with this lovely shade of pink will now and forever be infinite.